Bear with me; I’m getting confused while writing this so I can only imagine what reading it would do. But I do have a point. Scene takes place in the bedroom. Only when interrupted do you know that you are living in your head – lucid dreaming – and in that moment you are faced with what should be a rather easy choice to make; do you sleep it off? Or do you wake up and actually live the dream? You have a dream, you are aware that you are sleeping and dreaming, if you don’t do anything about it then the dream will be forgotten by the time you’re brushing your teeth. Entering a state of lucid dreaming can be achieved through several cues or triggers that can be practiced in your waking state and applied in your dream state. The light is now brighter than when you came in. You think to yourself; it’s on! Realizing the interruption of a light not turning off is not as simple as it seems, now you’re on to something. Behind you now are a chair and a table, on that table is a stack of white paper and a pencil. You start sketching away, thoughts scattered through the narrow paths created on what were once clean sheets of white paper, roads that seem as if leading to nowhere until finally the mighty pencil falls with the resonating sound of either failure or success, In that specific moment you can feel yourself waking up and becoming conscious, yet you decide that the dream’s not over and you want to keep dreaming. Most interruptions come as noisy irritating feelings of discomfort, a reminder that not everything in your head will end up being that living breathing organism we call design. a path of your own creation. Now you understand that you don’t have to wish for dreams to come true, they already are, what you can do is test the reality within a dream and live the dream within a reality. Design begins with ideas, those begin as dreams waiting to be understood, and for dreams to be understood they must be lived. 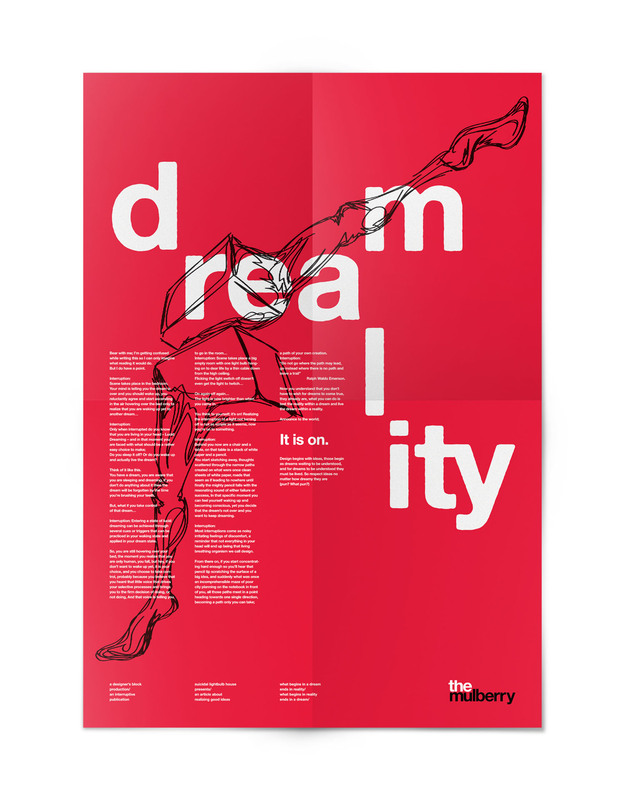 This entry was posted in Articles On Design, Articles On Posters and tagged design, Dream, Grey, illustration, Interruption, Lucid, poster, Reality, red, white. Bookmark the permalink. that was a both ambiguous yet entertainingly confusing to read and soak up, just like those moments where it feels you got an overdose of steaming information while boxed up in a tiny cube causing you to have a head rush that soon enough calms down to a logical state of mind. anyway now i’m rambling…thanks for posting this mind provocative post that pushed the elastic walls i have between the realm of dreams and reality!